It’s time for me to come clean. I’ve been putting off this day long enough. I have done something decidedly un-yikes-money-ish. I have started to upgrade my kitchen with money that would probably definitely be better suited to a long stay in my savings account. It all started just over a year ago when my sister called me out of the blue and said she wanted to give us a dishwasher. Our old dishwasher was, as she put it, disgusting. 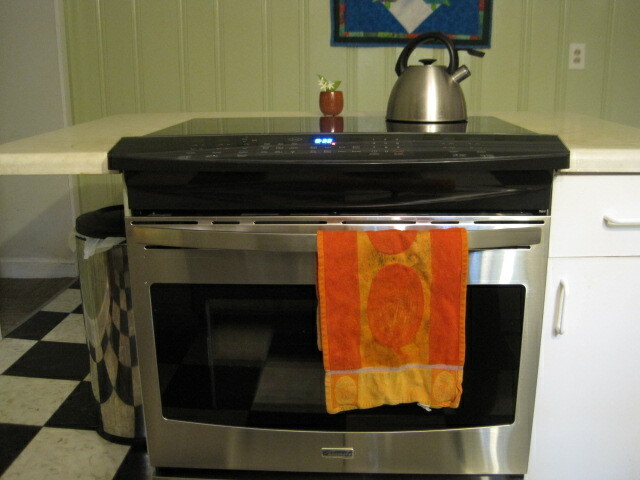 So she bought us this fancy dishwasher that is gorgeous (oh yeah, it washes dishes pretty well too). 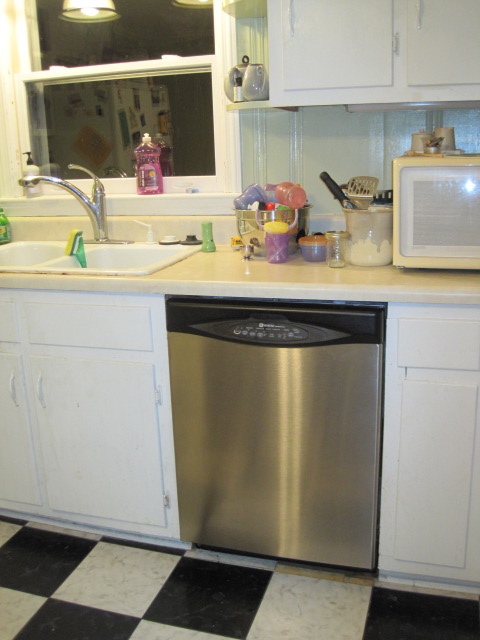 The dishwasher came with one problem: it made the rest of our kitchen look like crap. It’s not that the kitchen wasn’t dingy before the dishwasher came along, it’s just that when everything in a room is dated and dingy your eye kind of just gets used to it. But that beauty of a dishwasher made the rest of the room an eyesore. Now, don’t get me wrong, since the moment we bought this house I’ve been dreaming of updating the kitchen. I’ve given it a lot of thought. A lot. If only I were paid to spend time online looking at pictures of other people’s kitchens. Could that be a job because I’m really, really good at it? Anyhow, not long after we got the oh-so-fancy new dishwasher, my parents bought us the arguably even fancier new kitchen range. 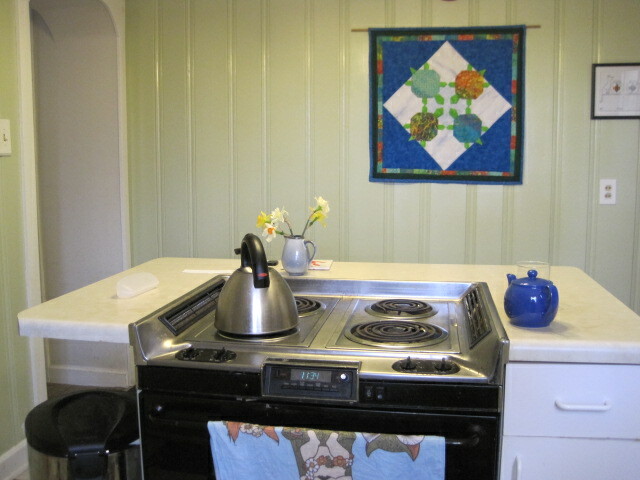 I know, some of these pictures are from before we even got the new stove. They’re the really “before” pictures. That light above the kitchen sink -- it hasn't worked in MONTHS. While I fantasized about gutting the kitchen and doing a complete remodel, that costs big, big bucks and let’s face it, I wanted to spend small, small bucks. So I figured the biggest bang for our bucks would be to replace the countertops, sink and faucet. 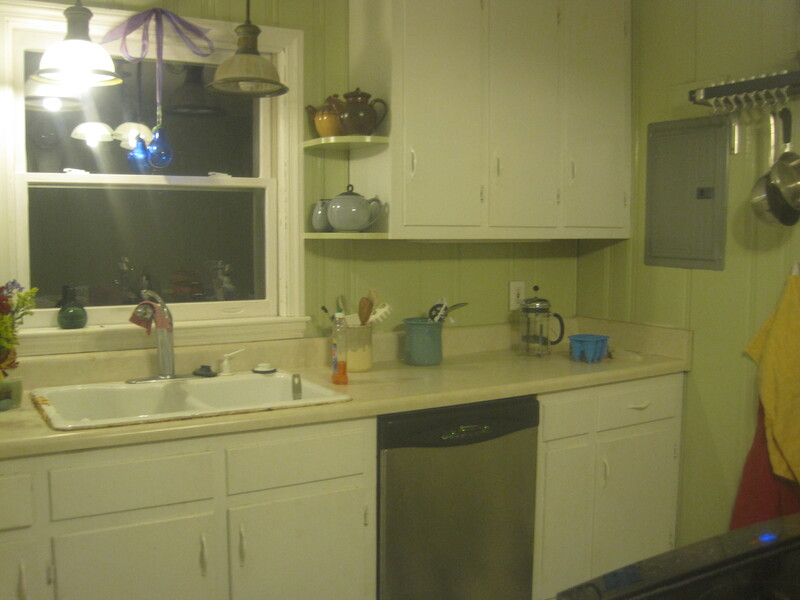 The counters were laminate and badly scratched and stained. 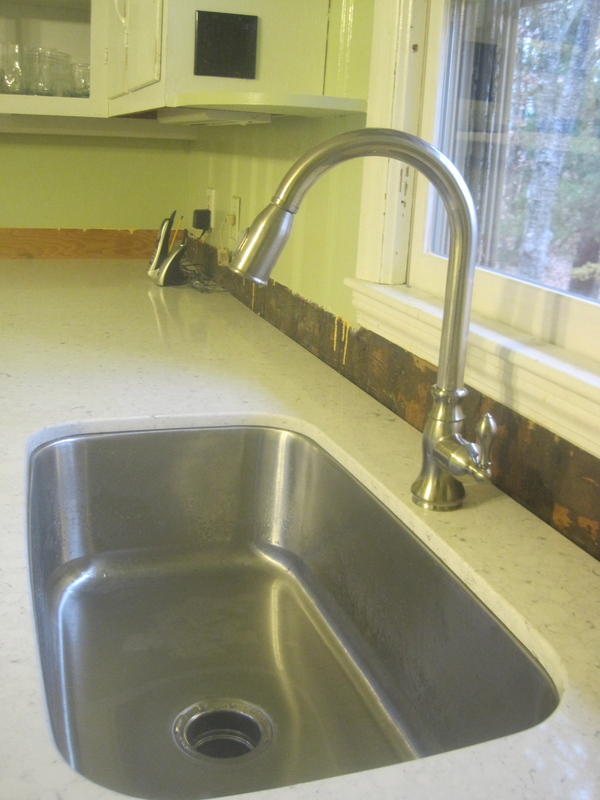 The sink, however, was really disgusting — it was rusting through on the edges (which you can sort of see if you scroll up a few pictures — look at the left side of the sink edge. Yuck, right?). I did a lot of research on different countertop options, and even more shopping around comparing prices. In the end, we decided on quartz countertops for their durability and style, and chose a stone called Bianco River by Silestone. It’s a white countertop with pale gray mottling. 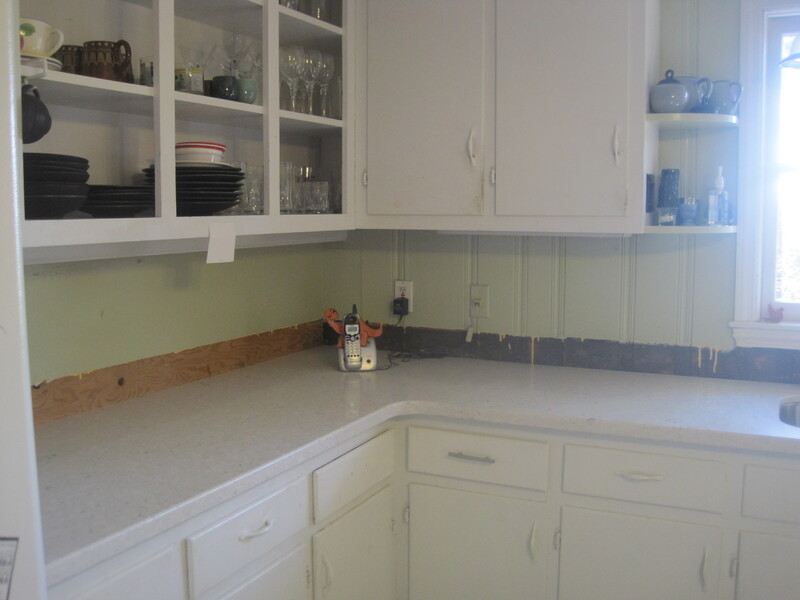 I’ve always loved the look of marble countertops but don’t like that they stain fairly easily. I needed something that would withstand anything I (or Charlie) could throw at it. So I waited for a sale at Home Depot (I noticed that they offer the same sale every 3-6 months) and ordered the countertops. I really wanted to buy the countertops from a local kitchen design store rather than a big box store, but, sadly, they couldn’t compete with the sale price at Home Depot and I couldn’t justify the additional expense. After I ordered the counters, they still weren’t installed for about a month. First someone had to come out to the house to measure the space and then they had to go away to order and cut the stone. Do you see that brand new sink? Yowsa! Our previous sink was a double bowl, drop in sink. This new sink, as you can see, is a big, deep single bowl and I love it. LOVE IT. I can put huge pots and pans in there, step back, and they’re completely hidden from sight. It’s like magic. We also got that new faucet which is great, but it can’t compete with the love affair I’m having with the sink. While the rest of the wood panelling is just painted, we couldn’t paint over the brown stripe because it was full of old, dried glue that couldn’t be removed. So next up for our kitchen update: a new backsplash. I figure that by the time we’ve finished all our little kitchen upgrades (which include many more items beyond a backsplash), we’ll have spent about $5000. And that’s how one “free” dishwasher is gonna end up costing some mighty big bucks. 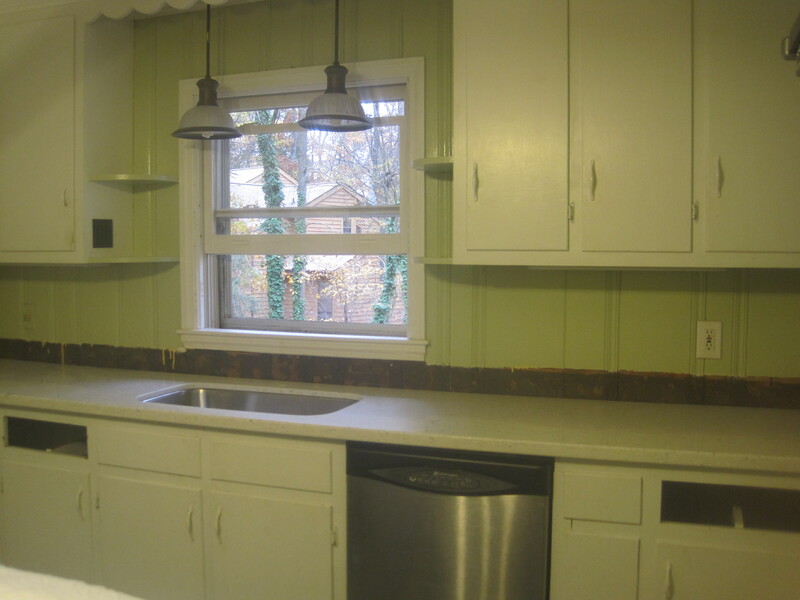 But I promise, from now on I’ll share our kitchen makeover journey along the way. Are any of you dreaming of renovating your kitchen? Or perhaps you’ve already created your dream kitchen? What features are you happiest with and what would you change in a heartbeat? Do tell! The one thing I did wrong when we built this house, and therefore created a brand-new kitchen, was get a lot of the cupboards much too deep – things get pushed to the back and are never seen again. Shallow cabinets are the way to go, so that you know what’s in them. 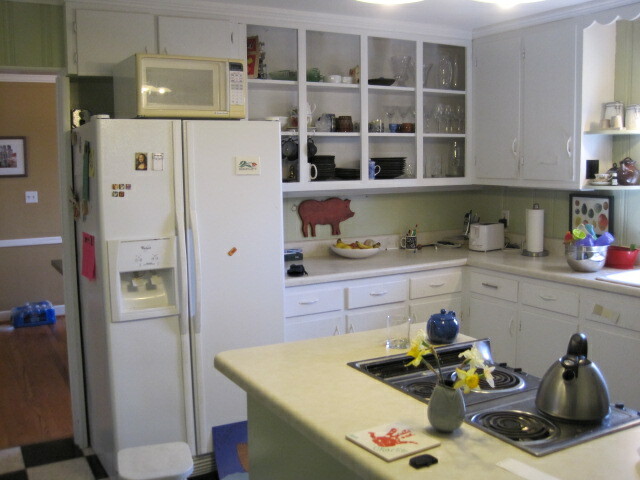 Jeanne, your kitchen looks fantastic! 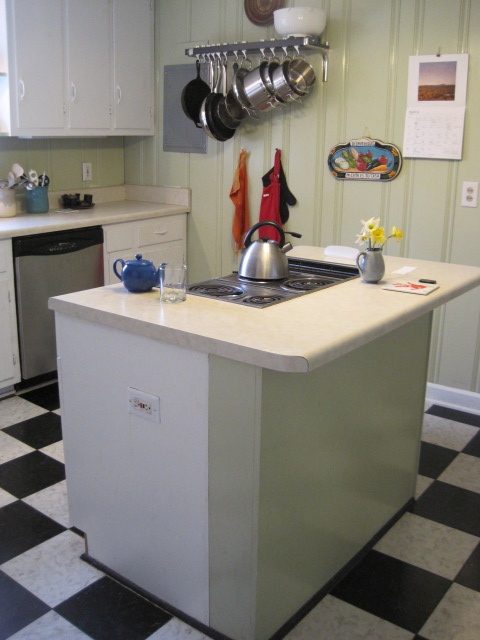 I’m inspired to re-do pieces of our very similar kitchen (though we have no updated appliances and some very dark old vinyl flooring to boot) so we have a loooong way to go. great to see what you’ve done. I’ve basically seen our kitchen in lots of different homes of this era. 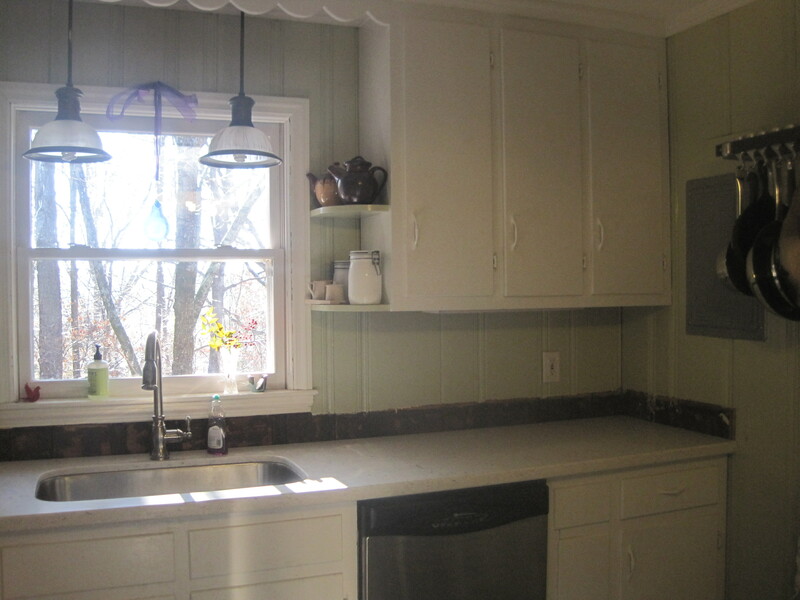 Not too long ago there was a house for sale in our neighborhood and I saw photos of the kitchen and had to do a double take because the kitchen looked almost exactly like ours.